« Recycle Your Family Tree! Ah, here it is; the end of October. That time of year when a girl’s thoughts turn to Black Friday, Thanksgiving dinner, and projects I can reasonably plan to make for Christmas gifts. Then I read a blog post from Lisa J. Jackson on the Live to Write – Write to Live blog. “Hey, I should write a book in November!” Enter ‘something-shiny syndrome’. To give a little explanation, the post I read was about NaNoWriMo, or National Novel Writing Month. It’s a challenge to write a book of 50,000 words or more in the thirty days of November. Sound crazy? Yeah, it is! But why not try it? So I signed up on the website with 300,000 of my new best friends around the world. What a great way to force myself to focus and write, with no restraint and no editing, for a whole month. Once I broke it down to a daily number-1667 words a day to be precise- it didn’t seem like such an insurmountable task. In fact, my enthusiasm has been passed on to my oldest daughter who will hopefully join me in the madness. However, there is always that little realist in me that likes to rear his ugly head, “How can you possibly fit 50,000 more things into your holiday frenzy?” That killjoy is an underhanded troublemaker who is constantly out to restrict my creativity. So here is what I am going to do; plan, plan, and plan. Yep, that’s right; I, Queen List Maker, will get a plan on paper and stick to it. Seriously. I know, I know I’m also full of good intentions and there’s probably a picture of me on my husband’s desk with the caption “Easily Distracted” written on it. But I think I can do this one. How you ask? I already have a number of homemade things that I can use as Christmas presents. I am making a list and shopping early—especially at small local shops—for the remainder. I like to save December for baking, not shopping. I have cooked Thanksgiving dinner so many times that I could probably do it in my sleep. The menu is the same and I already have the non-perishables in my cupboard. All holiday volunteering will be done in December instead of November this year. Chores are already delegated so we all do our share. If things are a little dusty for a month, eh, what’s a month? Laundry can be done simultaneously with writing. And yes, for thirty days I can deal with wrinkly clothes if necessary. I am blessed with a husband who likes to cook. We usually share this duty, but I will let him do extra and supplement what we have stocked ahead in the freezer. Most of all, what will help me to get through the next month without a nervous breakdown, is realizing things are not perfect. I am a Pinterest junky. I pin crafts, meals, Christmas tree pictures, etc., and they’re all perfect. 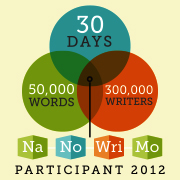 But for this year, for the thirty days of November, I will agree to accept ‘passable’ and write with reckless abandon. Why? Because I can.